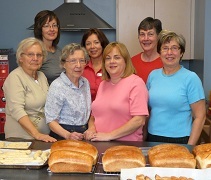 All breads used in our communion services are baked in our kitchen by this small group. Extra bread made is given to families celebrating baptism. Contact the church office for exact times of gathering.